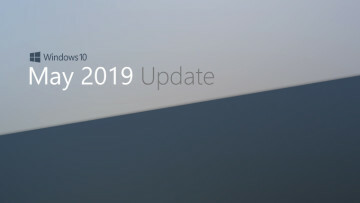 Earlier this year, Microsoft announced a new SKU of Windows 10 called Windows 10 S. Aimed at the educational market (at the time), it's just like Windows 10 Pro except users of the OS can only install apps that come from the Microsoft Store. 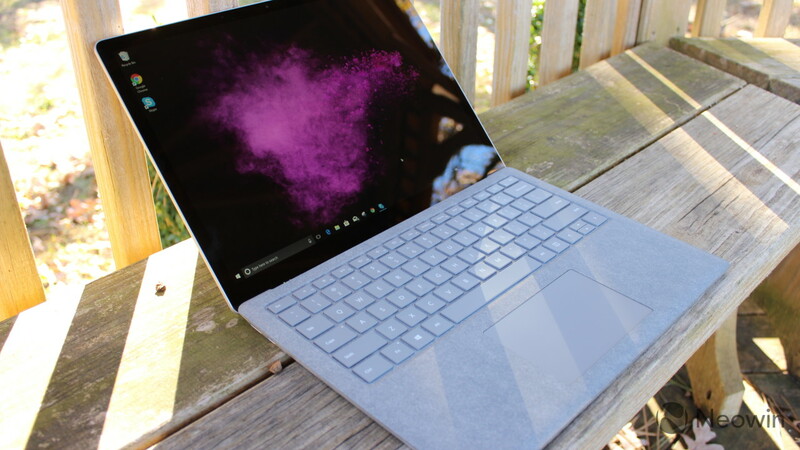 A range of laptops and convertibles were also announced running the new SKU, but only one was aimed at consumers: the Surface Laptop. 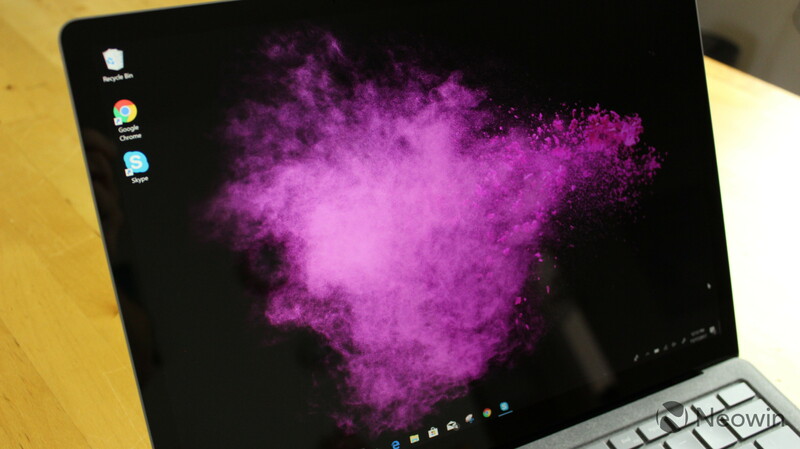 Historically, the Surface brand has served as a sort of reference design for the rest of the PC industry, defining new form factors for OEMs to emulate. 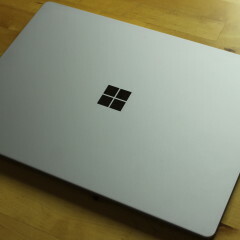 That's not really the case though with the Laptop, as this device is a traditional clamshell, and it's the first time that Microsoft has made such a machine. These are the specs of the model that Microsoft sent me, and it obviously comes in more configurations. I was sent the Platinum color, although I definitely think that Burgundy and Cobalt Blue are much prettier. 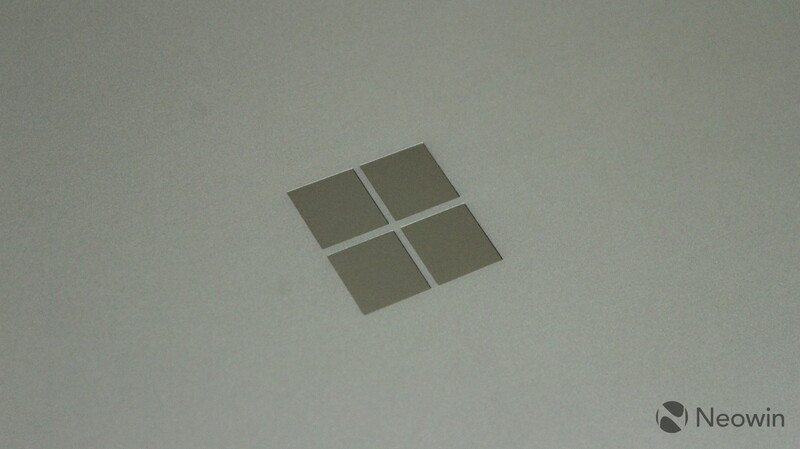 Indeed, the Surface Laptop does come in four colors, and it's the only Surface device to be made available in more than one. The reason for this is because other Surfaces, like the Pro, are made from magnesium, and to make the different colors, it would have to be aluminum, which would add about 60g to the weight. The Core i5 model only comes with either 4GB RAM and 128GB storage, or 8GB and 256GB, respectively. Only the latter comes in different colors. But the Core i7 variant is a bit more interesting. If you get it with a Core i7, it comes with 8GB RAM/256GB SSD, 16GB RAM/512GB SSD, or 16GB RAM/1TB SSD, the former two of which are available in all four colors. But the interesting bit is that these come with a Core i7-7660U (thanks Michael West), which means that rather than HD Graphics 620, you'll get the bump in performance that comes with Iris Plus 640 graphics. 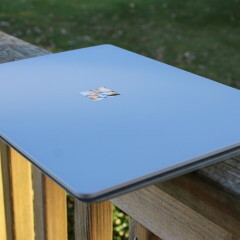 As I mentioned, the Surface Laptop comes in four beautiful colors: Platinum, Burgundy, Cobalt Blue, and Graphite Gold. I definitely would have preferred that Microsoft sent me the Burgundy or Cobalt Blue ones, because those are frankly stunning. The Platinum one is nice, and I'm certainly not doing it justice here, as the other colors are really much more pleasant-looking. Obviously, that's my own opinion and your mileage may vary. 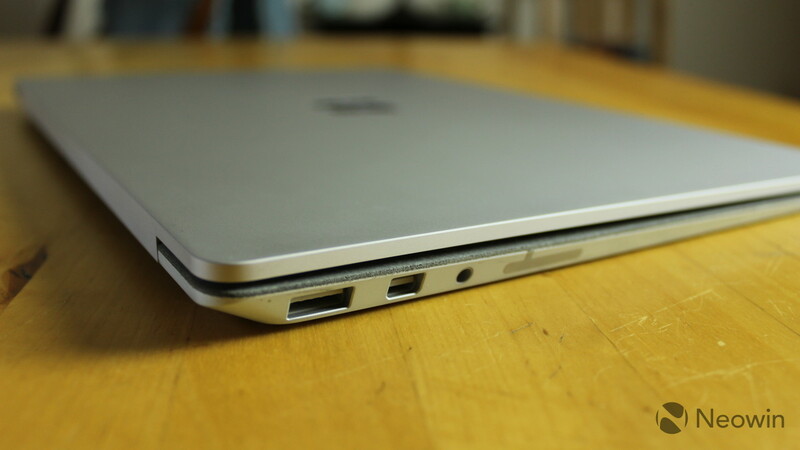 On the left side of the device, you'll find a 3.5mm audio jack, a USB Type-A port, and a Mini DisplayPort. 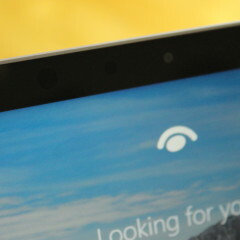 On the right is where the Surface Connect port is located. Personally, I think it's disappointing that the Mini DisplayPort wasn't replaced with Thunderbolt 3, which could be used for charging, USB Type-C peripherals, and powering up to two 4K monitors. Microsoft finally adopted Type-C with the Surface Book 2, but there's still no Thunderbolt. I'm also not a big fan of having only one Type-A port. I like to use a USB mouse, so whenever I have to use anything else, I have to disconnect it. A second USB port is always helpful, in my opinion. 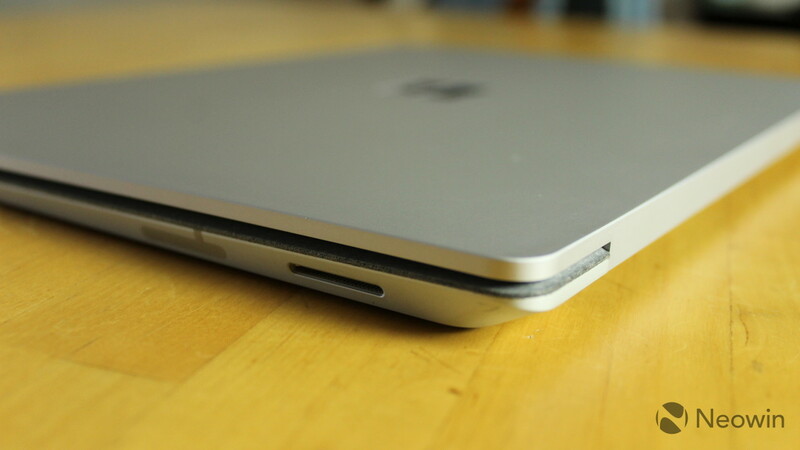 There's the option to use a dock with Microsoft's Surface Connect port, but aside from the fact that I don't want to have to carry one around, you have far less choices in docks since it doesn't use the standard USB Type-C. 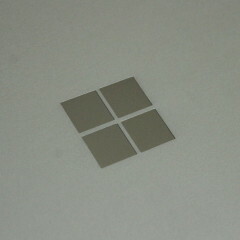 The top of the device has a chrome Microsoft logo on it, which gives the device a premium feel. 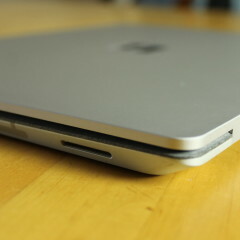 It's the same that you'll see on a Surface Pro or Book. 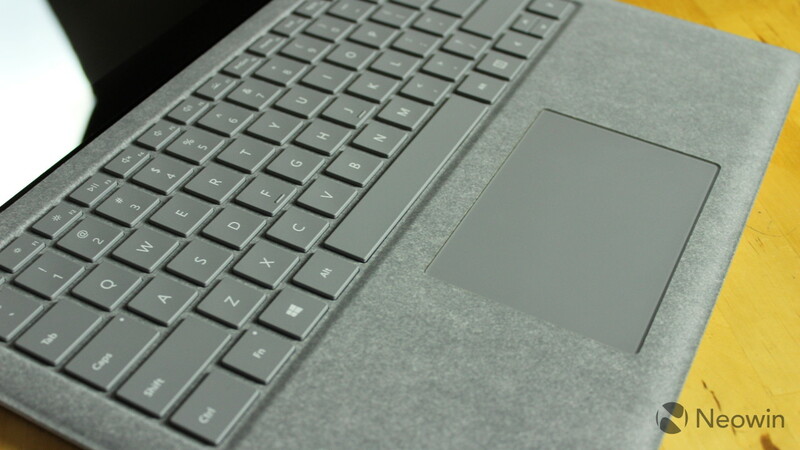 The area surrounding the keys and the trackpad on the keyboard is covered by Alcantara, which feels nice but unnecessary. Microsoft told me that the Alcantara has a film on it that makes it easy to clean. I can't tell you if this is true because I haven't had the Laptop for long enough to have that kind of wear and tear, but my Signature Type Cover - the first Surface device to use Alcantara - is beyond any form of conventional cleaning at this point. 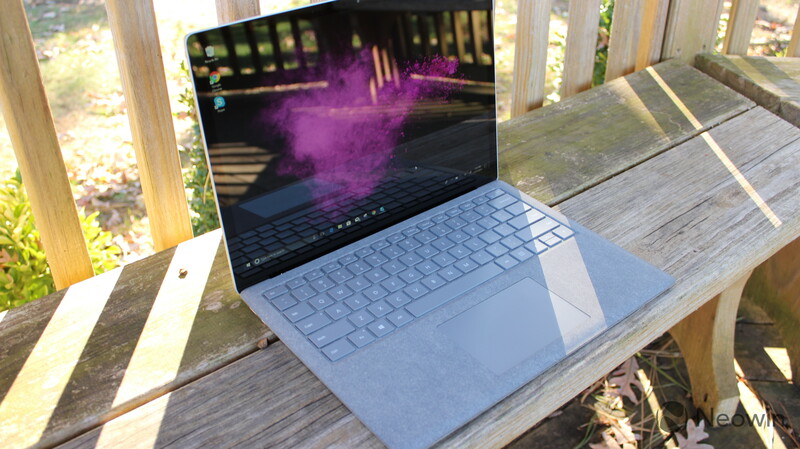 There are pros and cons to the display on the Surface Laptop. 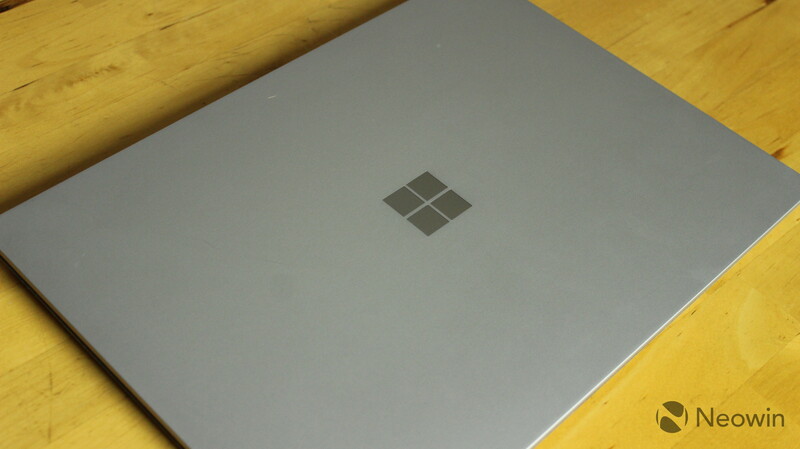 For one thing, Microsoft always uses great displays on its Surface devices. PixelSense always has accurate colors, and while I was skeptical of the lower pixel density compared to other Surfaces, there's no noticeable pixelation. On the other hand, I'm really not a fan of the 3:2 aspect ratio. 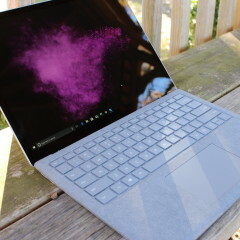 Those words are blasphemy for a Surface fan to say, but it just doesn't work for me. 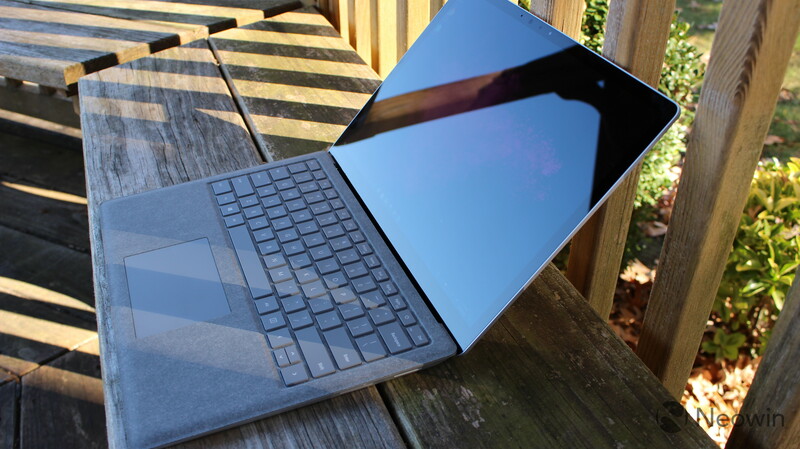 I do think that 3:2 is perfect for a tablet like the Surface Pro, or even a detachable device like the Book, but not a laptop. Most of the time, I have two windows side-by-side while I'm working, so a wider screen works out better for me. I much prefer a laptop with a 14-inch 16:9 display to a 13.5-inch 3:2 screen. One of the stranger choices that Microsoft went with is support for the Surface Pen in the Laptop. This is something that you'll probably never use, and you'd also be crazy to purchase a Pen just for use with it. I love that the company included such a useless feature though. If you do happen to have an N-Trig pen lying around and you need to sign a document or something, you at least have that option. Don't plan on doing a lot of drawing or anything though. Using the Pen on the Surface Laptop is not comfortable to do at all. But again, it's nice to have the option for when you actually need it. 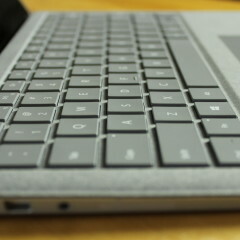 The keyboard almost feels exactly like a Signature Type Cover, if it had a sturdy base underneath it. I found this to be a bit disappointing, as the keys are plastic instead of metal. Still, it's very comfortable to type on, and it's not too sensitive. The Alcantara fabric feels soft and comfortable. Still, it just sort of feels like an unnecessary addition to the product to me. I'd have been just as happy with aluminum, as long as it had metal keys. One thing that I always appreciate though is having something that's different from everything else, and one thing that's for sure is that other companies aren't using Alcantara. Still, the most important thing is that it's comfortable to type on. And it is, not just because the area surrounding the keys is covered in a soft fabric. 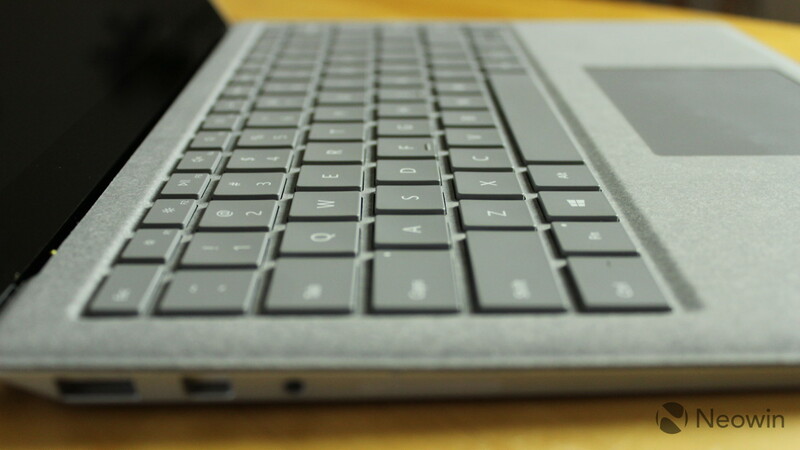 The keys are comfortably spaced, and it just feels natural. 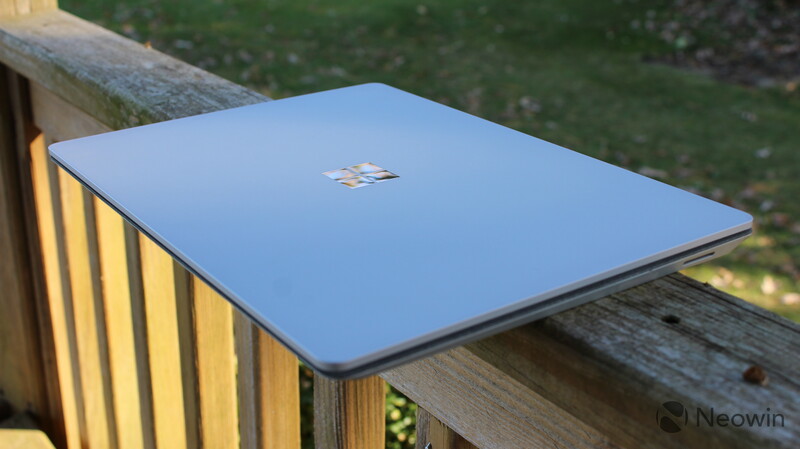 I've been using the Surface Laptop to type this review (and various other projects), and haven't had an issue. This, to me, is the meat of the review. Aside from the Windows 10 S OS, this is really just another laptop. So here's the deal. The Surface Laptop comes with Windows 10 S, but as long as you do it before next March, you can upgrade it to Pro for free. After that, it will cost $49. 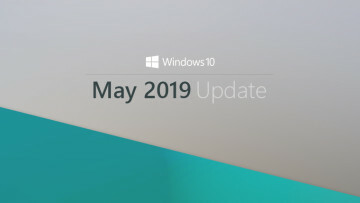 The good news is that once you upgrade, the PC is licensed for Pro, so even if you go back to Windows 10 S, you can upgrade to Pro again for free, even after the promotional period has ended. For the majority of the time that I've been using the Laptop, I used it with Windows 10 S, and then for the last week or so, I've used Pro. Windows 10 S is a lot better than I expected it to be. For the most part, it provided everything I needed. The Edge browser worked well, and now that I can finally sync all of my bookmarks and such to my Android and iOS devices, it's actually a feasible option for me. The Microsoft Store is still pretty terrible though, but you can find some good apps in there, like Netflix and Hulu. Some games work well with the integrated graphics as well, like Cuphead, and you can easily just plug in an Xbox One controller into the USB Type-A port. You can also use the previews of the Office 2016 apps in the Store, which all work pretty well, although there are a few minor kinks that need to be worked out. With the Edge browser, some light games, Office, and more, I think many people are good to go with Windows 10 S. Not me though. 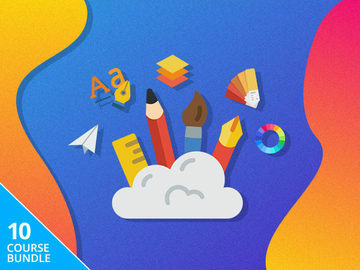 For my normal workflow, I need to use Adobe's Creative Cloud suite, with apps like Photoshop and Premiere Pro. The Microsoft Store has Photoshop Elements, but that costs $99.99, and I won't pay that when I'm already paying for Creative Cloud. And that all raises a deeper question. You might be fine with a browser, Office, and web apps, but are you sure that you won't need more than that at some point? As a consumer, you probably want a laptop that costs over $1,000 (or over $2,000) to last you a few years, and it's hard to project what software you'll need two or three years out. Because of that, I recommend upgrading to Windows 10 Pro, even if you roll it back. Just keep the option there, as the PC will be licensed. If you don't do it by the time that the deadline is up in March, it's not a massively expensive upgrade at $49. I also found Windows 10 S to be fast, with fantastic battery life. It's more secure, with the lack of non-Store apps, and the machine should maintain performance over time, as it doesn't "rot". One-click uninstalls are nice, rather than going through an entire process that leaves a bunch of crap behind. I was told by Microsoft in May that if you install Visual Studio with all of the options checked, it makes 100,000 changes to the registry. If you uninstall it immediately after, not everything is exactly the same as it was beforehand. This isn't an issue when you install apps from the Store, even if it's a Win32 app like Office 2016. Keep in mind that Windows 10 S is nothing more than a locked down version of Pro, so you get features that aren't in Home like Hyper-V. According to the Store listing, the only things missing from 10 S are the ability to install any app and to join a domain. 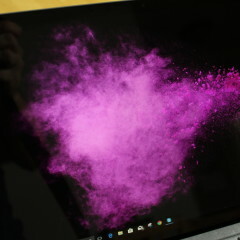 When I did choose to upgrade the Surface Laptop to Windows 10 Pro, it gave me a bunch of issues. It's easy enough to do, and I've used the Store to upgrade from Home to Pro many times (just search for Windows 10 Pro in the Store). I upgraded the machine to Pro, and did a factory reset, and everything just went bonkers. After resetting the machine, I was able to install Win32 apps like Google's Chrome browser, but if I used the 'Winver' command, it said that it was running Windows 10 S. Also, the Edge browser was completely gone, and I was unable to open Settings, so I needed to use a physical recovery drive to reset it again. 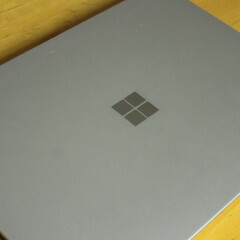 Luckily, Microsoft makes Surface recovery images readily available. Once I restored it to Windows 10 S version 1703, I upgraded it to Pro once again, and left it. The Surface Laptop, like the rest of the Surface device lineup, uses facial recognition for Windows Hello. It's really good at it too, and frankly, I've often wondered why very few competitors have been able to provide such a stellar biometric authentication experience. Facial recognition is a natural way to log into a laptop, because when you turn it on, it sees you, and you're signed in. There's no effort required. Other OEMs seem to struggle with this, for whatever reason. Third-party PCs that I use often show the "getting ready" message for a few seconds before the camera actually launches, and even then it takes a while to recognize me. 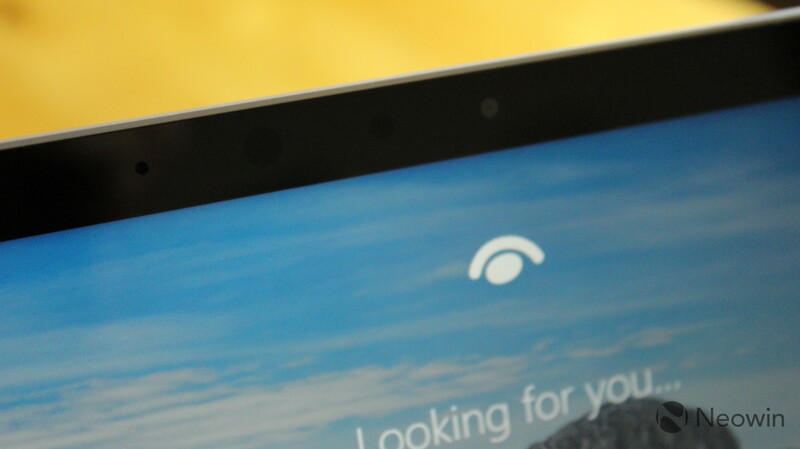 Windows Hello is the one area where I've always had an experience above and beyond the competition with Surface. 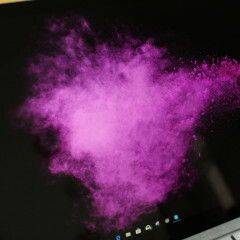 The battery life on the Surface Laptop is wonderful, at least when it's running Windows 10 S.
The thing is, companies often make claims of a certain amount of battery life, and it's never accurate because the conditions used in testing aren't close to what you'd use in real life. For example, we all know that Edge is much better on battery life than Chrome is, and in general, UWP apps are better for it than Win32 apps. So it shouldn't be surprising when an OS that can't run Chrome gets great battery life. From my usage, the Surface Laptop running Windows 10 S can easily get 10 hours of battery life, although I think that in most cases you could stretch that to 12 hours. 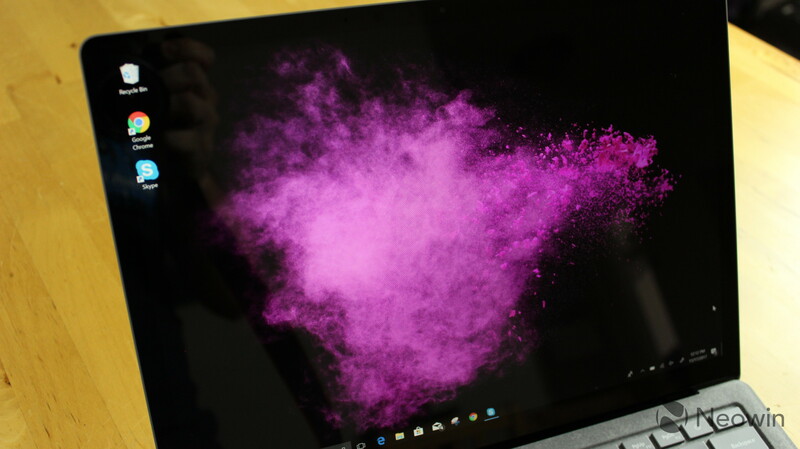 Naturally, when you make the move to Windows 10 Pro, it just becomes a regular ultrabook. However, to be clear, it's not actually the OS, but how you use it. If you convert it to Windows 10 Pro and then still only use apps from the Store, nothing will change in terms of battery life. Of course, once you start installing Win32 apps, those things will start booting up at startup and you'll immediately begin seeing a change. The more you use those apps over Store apps, the harder it will be on battery life. It's not terrible though. Using apps like Chrome and the occasional Photoshop, I got close to eight hours of power. 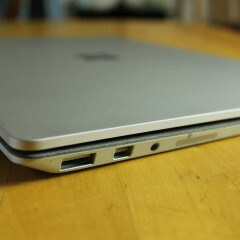 Also, as I mentioned earlier, it still disappoints me that the Surface Laptop charges via Microsoft's proprietary connector, Surface Connect. 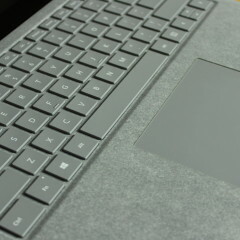 Surface Connect is USB 3.1 Gen 1, meaning that it can transfer data at speeds of up to 5Gbps, whereas if Microsoft used Thunderbolt 3, it could transfer at speeds of up to 40Gbps. This is an area where Microsoft is lagging, even with the Surface Book 2, which has USB 3.1 Gen 1 Type-C. Throughout this year, I've reviewed premium portable PCs from Huawei, Lenovo, Dell, HP, and more, in form factors such as ultrabooks, gaming PCs, workstations, convertibles, and detachables, and all of them offered Thunderbolt 3. More importantly, I can use the same charger on all of them. 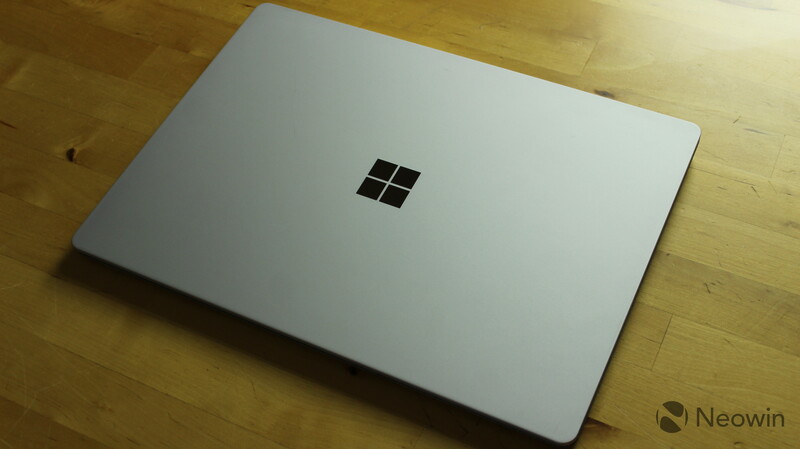 Earlier this year when I went to Microsoft's Ignite conference, I brought five PCs with me for various reasons. I only needed two chargers for them: one USB Type-C charger for four of them, and another charger for the one Surface I brought with me. This model of the Surface Laptop uses a Core i5-7200U processor, which is the least powerful seventh-generation Core i5 U-series chip. I'm not trying to bash it, as it's still fine for most use cases, but that's what it is. There's another SKU that offers a bit more power (7300U), and there are others that offer Iris Plus 640 or 650 graphics. Instead, if you want Iris Plus 640, you'll need to get the Core i7 variant, which actually offers the top model, the i7-7660U. The point is that it's not just a small bump from i5 to i7; there's actually a real value proposition there. I found that my i5 and 8GB RAM is fine for most workloads, especially if you plan to stick with Windows 10 S. I did start to notice a little bit of lag when I upgraded to Pro and started loading a bunch of tabs in Chrome. I used PCMark 8 for benchmarks, obviously in Windows 10 Pro since that's not a Store app. There are three tests: Home, Creative, and Pro. 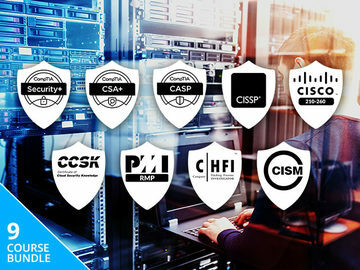 The first test is Home, which tests basic use cases such as web browsing, photo editing, casual gaming, video chat, and more. As you can see, the Surface Laptop scored better than 27% of other PCs. That's about what you can expect from this particular Intel chip, and it's not necessarily bad. Next up is Creative, which tests video editing, photo editing, advanced gaming, and more. Interestingly, the Laptop scored even better on the Creative test. Finally, the Work test checks up on productivity-related tasks like writing, spreadsheets, video chat, and more. 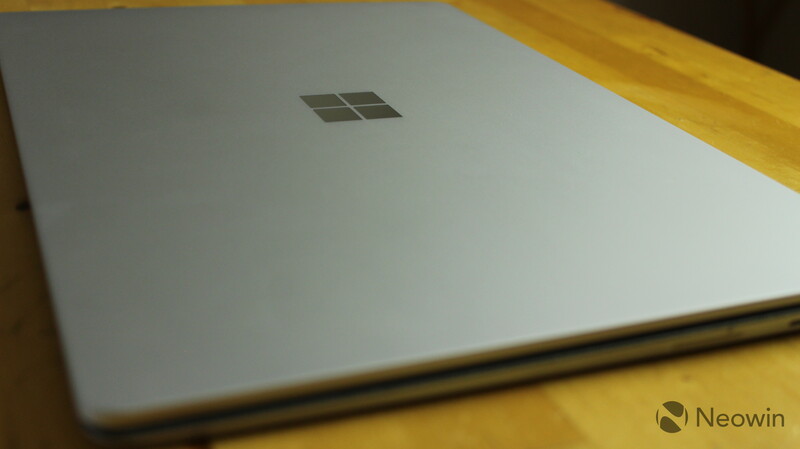 The Surface Laptop scored quite well in the Work test. 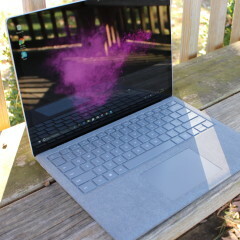 Microsoft's Surface Laptop is actually a lot better than I expected it to be. 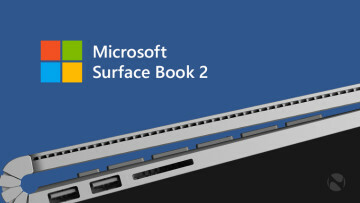 Yes, the selection of ports bothers me greatly, although you won't mind if you're already invested in Surface accessories, but the Laptop is just a really pleasant device to use. 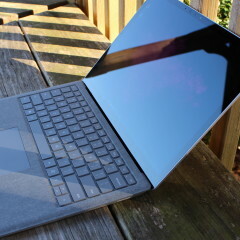 It's comfortable to type on, much more so than I realized at various events where I got to try out the device. The Alcantara fabric around the keyboard feels soft when I rest my hands, and even though it's the Platinum model, it still looks and feels really nice when I take it out of my bag. 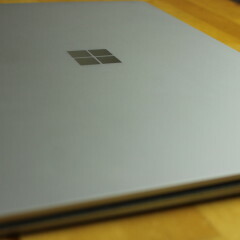 The machine is instantly responsive when I hit the power button; when I press it, I immediately see the Surface logo on the screen, and then as soon as Windows loads, I'm logged in via Windows Hello. I don't think that I'd pay $1,299 for this particular model though, as I'd want the Core i7-7660U, along with 16GB RAM. The cheapest model that offers those is $2,199, so the Laptop does get pricey, and I'd go so far as to say it's too expensive for something without Thunderbolt 3.